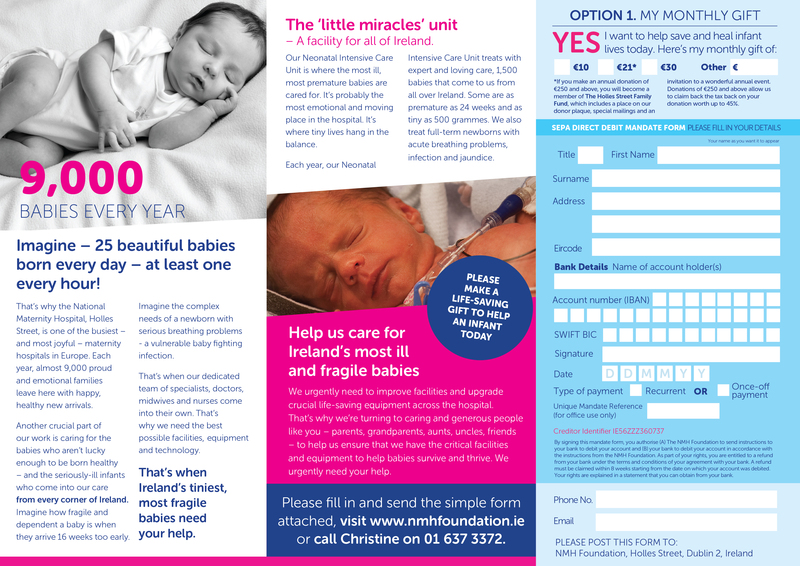 Please donate & join The Holles Street Family Fund and help us continue our vital work to give our mothers and babies the best possible start. The National Maternity Hospital, Holles Street, is one of the busiest – and most joyful – maternity hospitals in Europe. Each year, almost 9,000 proud and emotional families leave here with happy, healthy new arrivals. Another crucial part of our work is caring for the babies who aren’t lucky enough to be born healthy – and the seriously-ill infants who come into our care from every corner of Ireland. Imagine how fragile and dependent a baby is when they arrive 16 weeks too early. We urgently need to buy new life-saving equipment, to upgrade out-of date machines, and to refurbish facilities. By joining The Holles Street Family Fund through a regular donation of just €21 a month, you will be helping continue to save and heal fragile lives! Download a copy of our leaflet today or donate online. Join us and Help Deliver Ireland's Future!